Fred Dutton of Official Nintendo Magazine got his hands on the Legend of Zelda Spirit Tracks, and with the newest release of the magazine hitting shelves this Friday, Fred has answered many questions concerning Spirit Tracks. The answers don’t give away too many spoilers, so unless you are trying to stay away from everything related to the game, it should be safe to read. There were naturally several comparisons to Phantom Hourglass. Lets first start off with some of the bad news. Fred’s answers conflicted with some previous thoughts that have been said about the game. One in particular is that Fred says the game is rather similar in difficulty to that of Phantom Hourglass, which will undoubtedly be disappointing to many Zelda fans who felt Phantom Hourglass was just way too easy. Additionally, it has been confirmed that the game has just five major dungeons, although he did state there were several minor dungeons. 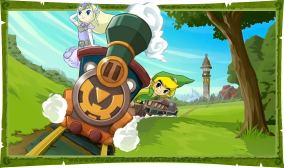 The train seems to be a complete replacement of the steamboat from Phantom Hourglass. Just as Linked docked at fixed locations in Phantom Hourglass, he gets off his train at fixed train stations, meaning there is no open overworld navigation. Lastly, Fred mentioned that there isn’t as much customization of the train as there was with the boat in Phantom Hourglass. There was plenty of things mentioned that I felt could be considered good news. Fred states that Rupees play a more prominent role in the game as things are more expensive and treasures return and play a role. He mentions that there are several returning characters in the game from the Wind Waker and Phantom Hourglass that we don’t know of yet, but he did not spoil who these characters actually are. Fred also says that there are returning races in the game, as well as a few new ones. Perhaps one of the more exciting things that he said concerned the storyline of the game. His response to what the storyline is like is posted below. This is one of the strong points in my opinion. Out of all the ‘toon Link’ titles, it’s easily the darkest and the Phantom Zelda conceit is a great little twist. Cole is a memorable adversary, there’s plenty of fan service in the narrative and, all in all, it’s a really tight package. It’s looking more and more like the storyline will attract Zelda fans that were turned off by the storyline of Phantom Hourglass, while the gameplay, difficulty, and openness (or lack thereof), will resemble Phantom Hourglass. The game is set to ship in North America in just three weeks on December 7th.